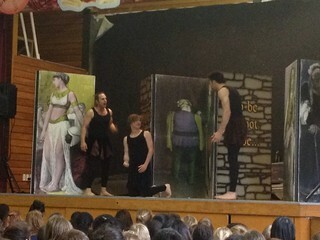 ﻿On Tuesday last week, the Ugly Shakespeare Company came to Tawa Intermediate to perform Hamlet. As we walked into the hall, I could feel the excitment in the air- this was the day we had all been waiting for. Three strange men walked onto the stage wearing crazy, old fashioned, pouffe shorts and black tops. One of them pretended to answer a cell phone and discovered it was the vet calling about their pet unicorn that had leprosy that it got from a leprechaun, and its horn had fallen off. Then he told the other two, and one of them started to cry so they went backstage, and one of them came out and tried to make a distraction. He started to recite a crazy poem and then he turned it into an island style song and the other two came out playing ukuleles. They were singing a love song and one guy jumped off the stage and blew a kiss to a girl in the audience. They finally got round to the point and said that they were going to do Hamlet to honour their pet unicorn. The play was really funny and at one point they stopped because no one would play Polonius because they were all angry at each other and one guy had vanished. They all did an apology song and dance so that someone would play Polonius. The Grand Finale was so funny because bang, crash, boom the whole set fell over because they were trying to kill each other and saying that they were going to die last and they just kept arguing. A great second blogpost. I like that you have added a picture to your writing as it really makes it come alive. I also like that you have been using linking words like finally, then and next which are ways to join your recollections together. Do you think there should be more performances at TIS? I think their should be more performances at Tawa Intermediate because the ones we have had so far have been great.